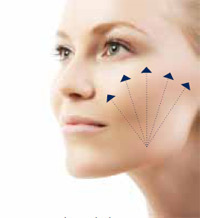 There are different essential and recognized techniques used for injecting dermal fillers to model facial contours and volumes and to fill wrinkles and folds. Various injection techniques have been described. Familiarity with all of these techniques is vital to improving efficacy and aesthetic results. This technique is a superficial intradermal technique which consists of performing a series of injections 2-4 mm apart. The tip of the needle is inserted to a depth of 1 to 2 mm. This intradermal technique involves injecting a very small quantity of dermal filler (drops) into the superficial dermis and can be used for rejuvenation and rehydration treatments. This intradermal technique involves injecting a very small quantity of dermal filler (drops) into the superficial dermis. The tip of the needle is inserted to a depth of between 1-2 mm. This technique involves injecting a resorbable implant into the deeper dermis and a resorbable filler into an upper layer of the dermis (mid or superficial dermis), according to the area under treatment and the desired volume. For this technique, the full length of the needle is inserted into the middle of the wrinkle or fold to create a channel. The product is usually injected while the needle is slowly drawn backward, so that “threads” are deposited along the length of the wrinkle or fold. Cross-hatching is especially effective for filling the oral commissures. The needle is inserted in a fashion similar to that used in linear technique. But before beginning the procedure, the cross- thread lines should be carefully demarcated. This technique is used when a relatively large area requires correction. The needle is inserted in a fashion similar to that used in linear technique, but immediately before the needle is withdrawn, its direction is changed and a new line is injected. This technique is best suited for deep malar injections. This technique is best suited to enhance or augment the lips by injecting almost vertically from the white roll rather than injecting parallel to the lip contour. It is a simple way to have optimal control over both shape and volume in enhancement, especially in case of asymmetrical lips, lip pockets and when correction of a previous suboptimal lip augmentation is rquiered.